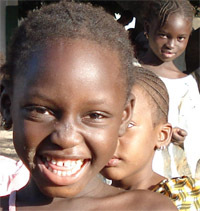 Healing Hearts started assisting the Femmes Handicapees de Tombouctou in 2006 by helping to pay the utility bills for their centre. We were introduced to this group by our friend the photographer and healer Joseph Hunwick from Glastonbury who regularly goes there to photograph the ancient manuscripts of Timbuktu. His father John Hunwick is a renowned expert who has been translating these manuscripts for the last 40 years. In 2007 we were finally able to go to Timbuktu ourselves, partly spurned on by the nationwide search for a suitable English twin town. Our hometown Glastonbury had been shortlisted. 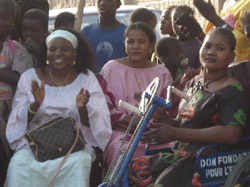 The ‘Centre de Femmes Handicapees de Tombouctou’ is a meeting place where disabled ladies sew, produce soaps and other goods which they sell in the market, trying to become self sufficient. 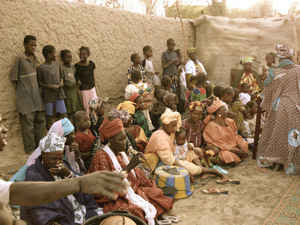 Wheelchair-users have a very hard time in places like Timbuktu with almost every street being sand on which wheelchairs do not work. The only vehicle that will let disabled people move independently is a motorised tricycle costing £1000 each. These are strong enough to go through the sand. For the time being we are trying to find funding for all of the 40 handicapped ladies to get one each. 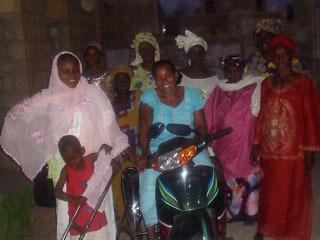 Femmes Handicapees receiving their first motorised tricycle in January 2011 from Healing Hearts. Hopefully more soon! 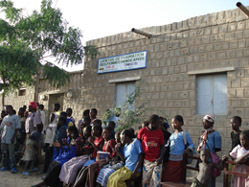 The heart of Timbuktu is being destroyed. Help the Handicapped Ladies survive. A bag of rice costs £25. Please donate!